My friend Valerie was telling me how she frequently brings a book to dinner with her husband as he’s often distracted by calls, emails and texts. She feels silly sitting at her “table for two” with no one to talk to. Really? Is this what date night has come to? Here’s an addition to restaurant etiquette that I think would do us all a world of good. The Opérateur de Cellulaire. (Things sound better in French, and they are exemplary when it comes to luxuriating in a leisurely meal). Yes, in addition to the Maitre d’ who looks after our dining experience, and the coat check person who attends to our jackets and umbrellas, we need a responsible individual to chaperon our precious cell phones. An official phone ticket could be forked over so there is no fear in surrendering, and we would be comforted in knowing that our phantom limb would be returned at dinner’s completion, or when duty calls (a.k.a. checking in with the baby sitter). We need this, not only to give us a respite from our always-on culture, but also to save our marriages, our friendships, and our relationships with all those we like and love. Or maybe a better idea is for a small drawer to be built into the side of the dinner table that keeps phones hidden, but protected from sticky crumbs or spilled soup. That way, we might remember what it feels like to engage in satisfying and undistracted conversation — to measure friend from foe, love from lust, and delicious chicken franchise from fowl. Listen, I’m sure as heck guilty too. But when I am out with my husband, I love the feeling I get when his eyes are only on me. When he really listens to what I have to say. And, with my friends and my children, it is the same. It took the human species thousands of years of evolution to learn how to share a civilized meal and build rapport through eye contact. 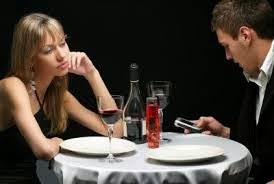 Let’s let go of our cell phones, and let’s let both our dinner and our dinner companion be a feast for the eyes.